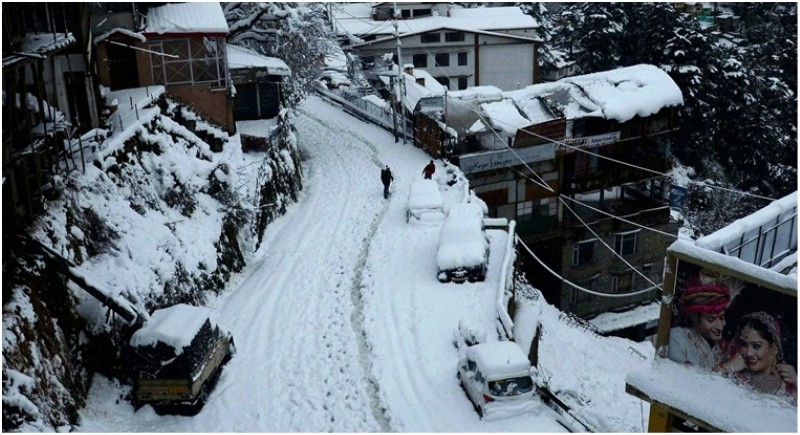 Dehradun, January 23: Uttarakhand received the seasons' heaviest snowfall on Tuesday. Nainital, Kedarnath, Gangotri, and Yamunotri received heavy snowfall; Mussoorie received nearly half-foot snow, while Dhanaulti is covered with snow since Monday night. Dehradun received incessant rain which started on Monday. Officials said, the Rishikesh-Badrinath national highway and some other roads are closed between Kund and Chameli due to snowfall. Met department said rain and snowfall might continue for the next few days. Badrinath, Yamunotri, Gangotri and Kedarnath are covered with snow, while many areas have been receiving rains for the past 24 hours. Cold wave has disrupted normal life in Tehri, Uttarkashi, Rudraprayag and Chamoli districts. Schools have been closed due to snowfall and rain in some districts. Road traffic in remote hilly areas has also been affected. While upper ranges of Uttarakhand are witnessing heavy snowfall, the plains received rains during the past 24 hours.